President Barack Obama kicked off a week of campaigning for Hillary Clinton with a stop in Ohio’s capital city Tuesday. Still president for another three months, Obama is all-in on Hillary as he campaigns on her behalf nearly each of the remaining days until Election Day next Tuesday, Nov. 8. In the next seven days, he will be in Florida for the third time in as many weeks, then make two trips to North Carolina. I decided to cover Obama’s remarks at Capital University Tuesday in Bexley, because even though I’ve covered him many times over the years, this would be the last time I would see him as President in Ohio. 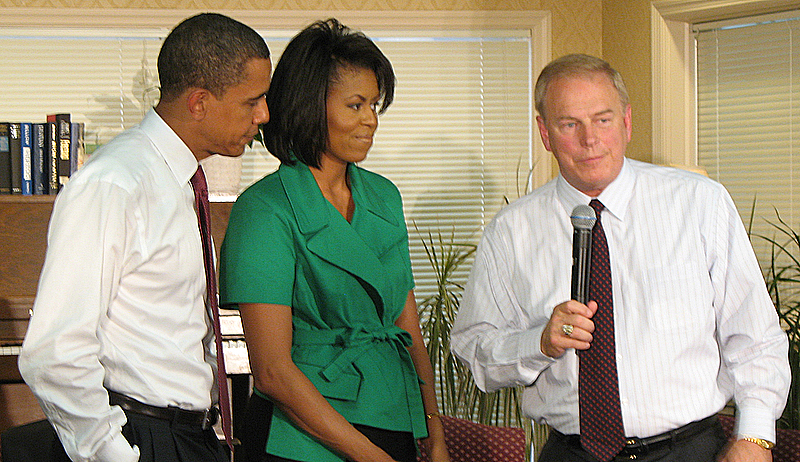 I was there in 2008 in Columbus, after he beat Hillary Clinton to win the Democratic nomination for president, when he and future first lady Michelle made their first General Election stop at a senior facility with then Ohio Gov. Ted Strickland, who supported Clinton, to press the flesh in a small room full of seniors, with national and local media crammed in the back. The first General Election stop Barack and Michelle Obama made in 2008, after he defeated Hillary Clinton, was at a senior center in central Ohio where then Gov. Ted Strickland joined them to talk retirement security. Covering people, politics, government and beyond at the time for Examiner.com, now deceased, I was close enough to feel the breath of both the nominee and his wife Michelle, as they shook every hand of every senior citizen in every row who turned out to listen them and Gov. Strickland make a united case for sending the couple to the White House later that year. But media was specifically instructed to not interact with them, which for this contrarian was tough to do. At Capital University today, my neighbors on the media riser was a group of Norwegians who were seeing Obama in action on the stump for the first time. Their answer to my question of who they thought would win this year was Hillary, by five-plus points one said, an audacious pick given that new polls show the race between her and GOP presidential nominee Donald Trump tightening. When I asked them what Norwegians thought of Donald Trump, they said their countrymen are afraid of him. The opening acts for Obama were Kevin Boyce, running for county commissioner, and Zach Klein, running for Franklin County prosecutor. Although he’s running behind Rob Portman in the race for senator in Ohio, Ted Strickland jogged his way to the podium, where he skewered his opponent Rob Portman on one issue after another. Ted was fired up. Too bad a mountain of money backing Portman fell on him, otherwise Ted joining Sherrod Brown would have been a dynamite duo. Central Ohio Congressman Joyce Beatty introduced the president with the same upbeat style and rhetoric that’s become her calling card in Washington and in her safe district back home in Columbus. Everyone knew what was about to happen when an unknown lady took out the presidential seal from a small pouch she held and affixed it to the front of the podium. Obama time was at hand. 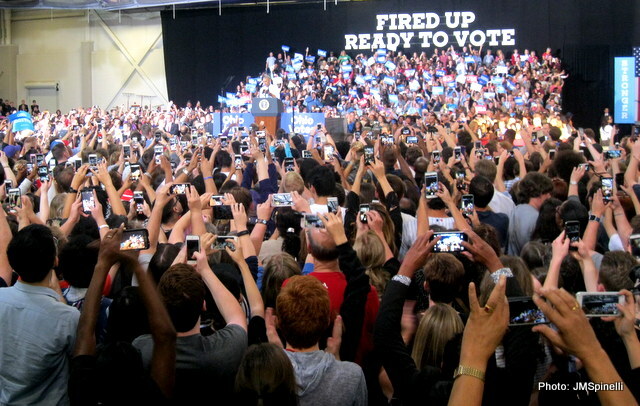 The president’s tall, slender frame entered the hall to a wall of cheers and a forest of arms that reached high with smart phones blazing to capture what is likely the last look of this president in Ohio’s capital city. A forest of hands holding smart phones were raised high to catch President Obama as he walked to the podium Tuesday at Capital University in Bexley. Whatever enthusiasm gap mainstream media likes to talk about for this year’s election for president was exploded by an enthused president who shared his passion for Hillary Clinton with a clearly enthusiastic audience. Mixing humor with seriousness, as he’s so accustomed to doing in such an effortless way, President Obama again made his case that, while his name isn’t on the ballot, everything else he’s accomplished in the last eight years is, as well as the future of those who came to listen to him and vote for Clinton. If Hillary loses, he said, all he’s done is out the window, as Republicans will reverse it all as fast as they can. Donald Trump said today in suburban Philadelphia that if he becomes president, he would immediately convene a special session of Congress to repeal and replace the Affordable Care Act [aka Obamacare]. The president’s remarks were not fear mongering since they repeated what Trump said he would do. Trump claims Obamacare is “a catastrophe” and vows to replace it “very, very quickly,” the AP reported. He spoke eloquently about the most important position in the land, and it’s not his job or any other elected officials job. It’s being a citizen. He urged everyone to vote. The value Obama placed on voting makes Ohio Gov. John Kasich’s vote for John McCain yesterday look even more foolish than it was, if that’s even possible. Likely the funniest part of his remarks came when he talked about free tacos on Wednesday. In Game 1, Francisco Lindor of the Cleveland Indiana stole at base at the right time. “We believe one great steal deserves another,” Taco Bell said. “So run into any participating Taco Bell location on Wednesday, November 2nd from 2pm to 6pm local time to score your free Doritos® Locos Taco,” the food giant’s website said. Obama picked up on the offer of a free taco, saying, “If you can find the time for a free taco, you can find the time to vote.” He even suggested a voter combo meal, where you feed your soul by voting, then feed yourself with a free taco.